This evening Rachel and I travelled down the Garden State Parkway through pockets of traffic and open highway, across the causeway and down Bay Avenue to our new LBI home. (And I still can not believe I am saying that, I am so blessed). After pedaling to Slice of Heaven and gobbling down our favored white pizza, we ended up at the playground just a stone’s throw from the house. Eagerly, we dashed over wood-chips towards the playground favorite: the swing set. Every time I begin pumping, kicking my feet toward the heavens, wind rushing past me as I drift back and forth, I am taken back to first grade. I can still distinctly remember the dainty classmate who would swing back and forth hair almost dragging the ground as she kicked her legs. She would jerk her head back on every up swing, her long, wavy, brown hair catching the breeze in just the right way leaving me dazzled (and envious from my toes all the way up) of my petite little peer. I longed for locks like hers so that one day I could be just as mesmerizing as I floated from the sky back towards Earth. Now, thirteen or so years later I still want to be that girl. Every time I go on the swings I do feel just a little bit more beautiful inside. There is something about the playful charm of swinging. The swings make you sort of hope you are just like way you look; full of the spirited innocence of a child on the inside, all the while stunning on the outside, simply captivating all the way through. Today I did not accomplish much because it was such a busy day with babysitting, my lacrosse clinic, field hockey, and gym workout. However, with the help of my sister I was able to package the mint my Grandmother gave me to sell from her garden, into little mesh baggies. The minty scent wafted up to my nose as I packaged, and the smell was phenominal. 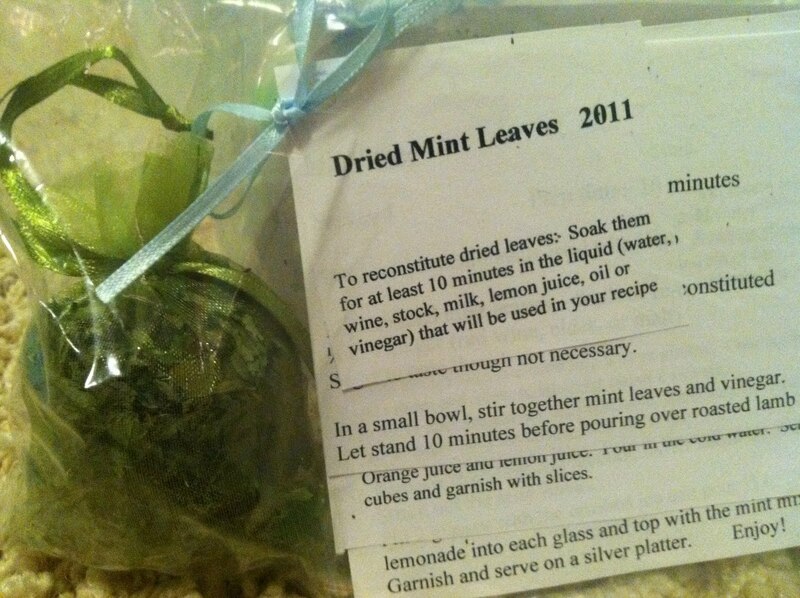 I also printed off some of my Grandma’s mint recipes and made little recipe books to go with each package, complete with little ribbon bows. Author sarahemeassickPosted on July 7, 2011 July 10, 2017 Categories UncategorizedLeave a comment on …3 Days! Anyone out there old fashioned like me? So you may say, “You aren’t old fashion, your writing a blog online, thats pretty new agey to me.” And yes, it is. I do indulge in e-mail, facebook, my new iPhone and other technologies but at the end of the day I’m a pen and paper kind of gal. I like my college notes to be handwritten (in Sharpie) and bound together in a binder as opposed to typed up in a computer file because by hand I am better able to express myself creatively. I was sick of putting all of my earned money in the bank and having it spent on knick-knacks, such as a pack of gum or a sharpie here or there, never knowing if I actually saved any money. I decided it was time for a budget. This way I could make sure I was saving cash while also allotting money to spend on clothes and crafts without feeling guilty. As one who can hardly turn her TV on, I found managing a budget on the computer would not satisfy my lifestyle. So I reverted to the childhood methods of keeping jars. I began the process by selecting some old plastic lotion jars I had been storing in my basement and labelled them each and designated a percentage of each jobs earnings to each category. And thus is sufficient for the life of a college student. All you adults are now gawking at my percentage of spending which I know will decrease when I need to support a family and am responsible for things like food. For now, this works and teaches me about the process of managing funds. Like I said, often I feel stifled in creativity because of technology, and being able to select jars, decorate them with sharpies and stickers allowed me to be who I am. Who cares if it seems childish? I am being me, child-like, quaint, and simple, but its the only person I know how to be.